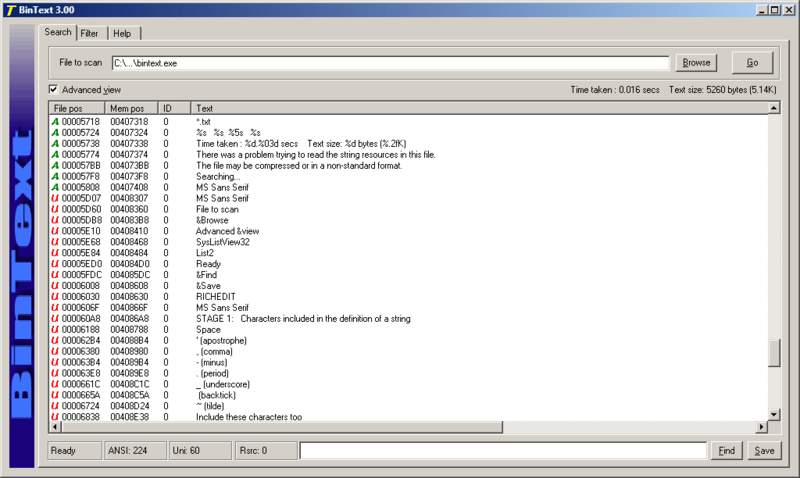 BinText is a file text scanner / extractor that helps find character strings buried in binary files. The program can extract text from any kind of file and display plain ASCII text, Unicode (double byte ANSI) text, as well as Resource strings. Additional useful information for each item is included in the "Advanced" mode. Uniquely, the program will show both the file offset and the memory offset of each string found. Although primarily targeted for programmers, it can be used by anyone interested in ferreting out character strings buried within binary files. Note: Although updated versions of the program exist, the 3.00 version is listed for reasons described in forums. How to extract: Download the ZIP package and extract to a folder of your choice. Launch bintext.exe. Here is an old (2006) but interesting narrative about using Bintext for viewing Unicode strings in executables. Place a shortcut to Bintext in your Windows SendTo folder so that you can quickly send files to BinText by right-clicking on their names and choosing Send To -> BinText from the drop-down menu. Can't find what you are looking for? This list shows entries with Programming - Resource Tools as a supplementary function. You can view more entries with Programming - Resource Tools as a primary function.